Jeep arrives next week (1-16 October) in the City of Lights and fashion world capital fully accessorised for the 2016 Paris International Motor Show with the Trailhawk, Desert Hawk and Night Eagle. 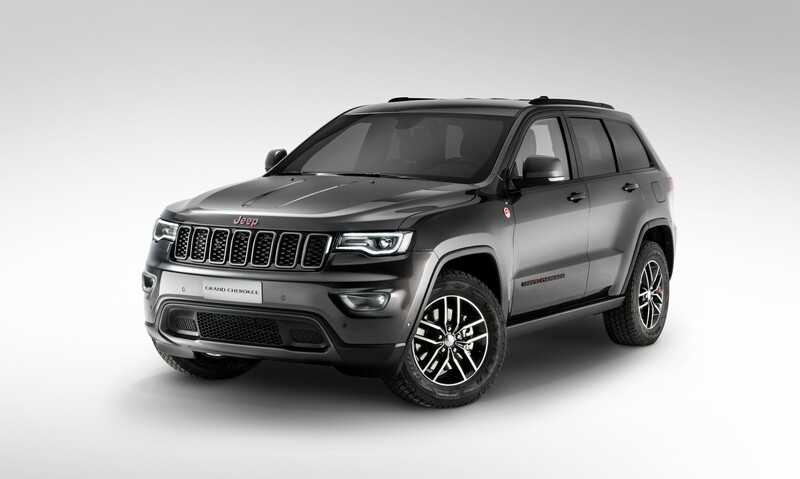 The biggest European show of the year sees the continental debut of the Jeep Grand Cherokee in its new TrailHawk and Summit versions, as well as two special editions, the Jeep Renegade Desert Hawk and the Jeep Cherokee Night Eagle II. Also along for the show is an extensive display of Mopar’s Jeep accessory range with a fully tricked-out Jeep Renegade and Wrangler showing how Jeep owners may fully express their desire for personalisation and adaption to their outdoor adventure needs. For 75 years Jeep has defined the authentic 4×4 driving experience, setting the benchmark for off-road capability and freedom since the first vehicle rolled off the production line in 1941. This year, the Jeep brand is celebrating its 75th anniversary, an important milestone enhanced by the significant sale success achieved in Europe where the brand recorded its 34th consecutive month of year-over-year sales growth in August. Revealed to the public at the New York Auto Show in March earlier this year, the new 2017 Jeep Grand Cherokee has been enhanced in terms of styling, standard premium content and trims. Further expanding the range of the most awarded SUV ever, the new Trailhawk model strengthens the off-road capability of Grand Cherokee by adding a host of specific off-road features, including the Quadra drive II 4×4 system with rear Electronic Limited Slip Differential, a unique version of the Quadra lift air suspension, for improved articulation and total suspension travel, as well as Selec-Speed Control with Hill Ascent Control. The 2017 Grand Cherokee lineup also features an even more exclusive and premium top-of-the-range Summit model characterized by a more upscale, hand crafted optional leather-wrapped interior, a new exterior look, and additional standard premium safety features. Also displayed for the first time in Paris is the 2017 model year of the high-performance Grand Cherokee SRT model, sporting exterior upgrades on the front fascia, fog lamps, and grille. On the Jeep stand at Paris Motor Show, two exclusive special edition models are displayed in preview for the European public: the Jeep Renegade Desert Hawk and Jeep Cherokee Night Eagle II. Further enhancing the offer of exclusive limited-edition trim levels designed around both the Jeep small and mid-size SUVs, the two models confirm that the natural flair for customization belongs to the entire Jeep lineup. At this year’s Paris Motor Show, the Jeep brand will also broaden the powertrain offer available on Jeep Renegade with the introduction of the dual-dry clutch transmission (DDCT) in combination with the efficient 1.6-litre Multijet II diesel engine and front wheel drive. Two ‘Moparized’ vehicles, the Jeep Wrangler Rubicon and the Renegade Longitude, both upgraded with MoparONE pack will be displayed on the Jeep stand to introduce the all-new special, off-road customization package offered by Mopar and including specific off-road accessories and lift kit. These packages feature homologated accessories and will be soon available for sale at the Jeep dealerships across the EMEA region. The 2017 Jeep Grand Cherokee is the star of the Jeep stand in Paris. The new model year of the most awarded SUV ever features an updated style, with changes that give the front-end a more premium and aggressive appearance, thanks to the redesigned lower front fascia with new fog lights and signature Jeep seven-slot grille. With the 2017 model year, the Jeep brand introduces the all-new Trailhawk trim level that will add further 4×4 prowess to the Jeep flagship, and will bring consistency in the Jeep range as already for the Cherokee and Renegade Trailhawk models. The new trim will highlight the legendary Jeep 4×4 capability by offering specific off-road features, combined to the premiumness, craftsmanship and advanced technological amenities of Grand Cherokee. At the same time, the refreshed Summit trim level, will enhance the refinement of the Jeep flagship model adding exclusive features in the cabin and in the standard vehicle’s equipment. The 2017 Jeep Grand Cherokee will arrive in Jeep EMEA showrooms starting December 2016. The Jeep brand introduced the “Trailhawk” name on the Grand Cherokee concept vehicle that first appeared at the 2012 Easter Jeep Safari in Moab, Utah. The idea was to deliver a unique and more rugged appearance, with a host of functional features that resulted in an increased level of off-road 4×4 capability. The “Trailhawk” name officially moved to production with the introduction of the all-new Jeep Cherokee in 2013, as the most capable version of the new mid-size Jeep SUV, and continued with the Renegade, the small SUV launched in 2014. Today, the Trailhawk name completes the Grand Cherokee lineup adding a sixth model to the Laredo, Limited, Overland, Summit and SRT trim levels available in the Grand Cherokee range. The Trailhawk exterior features a newly designed front fascia and seven-slot Jeep grille and Trailhawk unique, standard 18-inch Goodyear Adventure off-road tires with Kevlar reinforcement. The exterior look is further enhanced by new Trailhawk and Trail Rated badges with red accents, a Trailhawk-specific anti-glare hood decal, mirror caps and a roof rack with Neutral Gray accents. Standard skid plates and available Mopar Rock rails complete the exterior of the new Trailhawk trim level and deliver added protection when tackling extreme off-road trails. Inside, Trailhawk models feature a unique Black interior with leather and suede performance seats, red accent stitching on the seats, doors and console, brushed Piano Black appliques and gun-metal finish on all painted interior parts. A Trailhawk badge on the steering wheel completes the interior of the new Trailhawk trim level. Also standard is the 8.4-inch Uconnect touch screen with updated off-road pages showing wheel articulation and other vehicle 4×4 capability features, such as suspension height and 4×4 and Selec-Terrain modes. Grand Cherokee Trailhawk models are equipped with a host of standard off-road capability features, including standard Quadra-Lift air suspension – developed for Trailhawk – that offers improved articulation and total suspension travel, as well as upgraded Selec-Speed Control with Hill Ascent Control that allows the driver to control the speed of the vehicle, both uphill and downhill, using the steering wheel paddle shifters instead of requiring the use of the accelerator or brake pedals. Approach angles on the Jeep Grand Cherokee are 29.8 degrees, while the breakover angle is 27.1 degrees and the departure angle is 22.8 degrees. 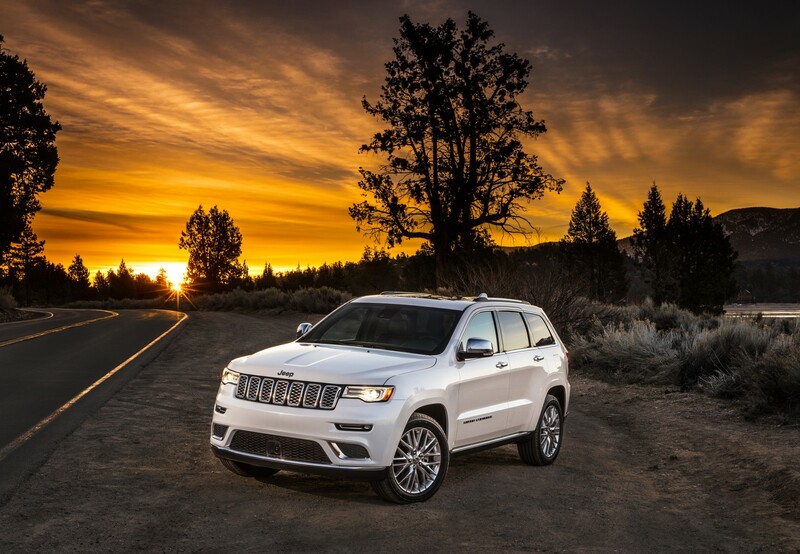 Grand Cherokee Trailhawk models offer up to 10.8 inches of ground clearance. The Grand Cherokee Trailhawk on display in Paris will be sporting a Granite Crystal exterior and black leather and suede seats and is powered by the efficient 3.0-litre Multijet II 250 HP engine matched with an eight-speed automatic gearbox. The Summit trim level represents the top of the range model and offers the highest level of sophistication featuring a new look with an updated front fascia, grille and LED fog lamps, and new 20-inch polished 5 spoke aluminum wheels. In the cabin, an optional new full-wrap Laguna leather interior in the two color combination of Indigo and Ski Gray is one of four color schemes featured on the new Summit. The new interior also boasts a Nappa leather-wrapped dashboard, center console and door panels, and Laguna leather seats with edge welting. Exclusive feature found on the Summit model is a nineteen-speaker, 825-watt high-performance Harman Kardon surround sound audio system. This state-of-the-art system features a twelve-channel amplifier, three sub-woofers and surrounds the occupants in high-definition sound. Other Summit interior colors are Black, Brown and Dark Sienna Brown. All Summit models come equipped with a suede premium headliner, lighted door sill, acoustic windshield and full side glass, Active Noise Cancellation system and premium Berber carpet mats. An array of technological and safety features are also standard on the 2017 Grand Cherokee Summit, including Lane Departure Warning, Parallel and Perpendicular Park Assist and Trailer Hitch Camera View. In detail, the Lane Departure Warning includes a forward-mounted camera that detects and measures the vehicle’s position within a lane. If the driver does not respond to the warnings, Lane Keep Assist will help gently nudge the vehicle back into the lane by applying corrective steering input. Parallel and Perpendicular Park Assist, on the other hand, is an advanced system that recognizes openings and prompts the driver with commands on how to park in a space by pushing a button to engage the ultrasonic sensors for parking assistance. This system combines with the ParkSense® Front and Rear Park Assist System to add an extra measure of safety and security. Jeep’s Quadra-Drive II 4×4 system with ELSD is standard on all Summit models, as is Grand Cherokee’s Quadra-Lift air suspension. The Grand Cherokee Summit showcased on the Jeep stand in Paris will boast an exclusive Pearl White three-layer-color paint exterior matched to a Ski Gray and Indigo Blue full leather wrapped interior and will be powered by the 3.0-litre Multijet II 250 HP engine with eight-speed automatic transmission. For 2017, the Grand Cherokee SRT model features a new aggressive front fascia with functional air intakes, incorporating an upper and lower slot which provides air to the cooling module and brakes, fog lamps and grille. The best performing production Jeep vehicle ever has a powerful 6.4-litre V-8 engine with Fuel Saver Technology that delivers 468 horsepower and 624 Nm of torque. Performance includes 0-100 km/h acceleration in less than 5 seconds, 0-162-0 km/h in 16.3 seconds, quarter mile (400m) in the mid-13 second range and a top speed of 257km/h. To fully appreciate the performance, the Grand Cherokee SRT has-exclusive Performance Pages with an expanded array of performance timers and gauge readouts, while the various drive modes including launch control, allow owners the ability to personalize their drive experience whether it’s on-road or on-track. Jeep Grand Cherokee SRT will be available in the EMEA region with comprehensive equipment that includes Nappa leather and suede sports seats, 20-inch alloy rims, Uconnect 8.4-inch system with DAB and navigator, Commandview panoramic electric sunroof, Lane Departure Warning, Parallel and Perpendicular Park Assist and Trailer Hitch Camera View. Launched exactly two years ago, Jeep Renegade is the model that most of all is leading the brand to record-breaking sales results at both EMEA and European level. Almost 330,000 Renegade have come off the production line as of August 31st, giving an important contribution in building up the brand’s spectacular commercial success. In 24 months, the Jeep small SUV has been firmly climbing up the sales charts in many countries, including Italy – the first market for Renegade in the region – the UK, France, Spain and Austria. During the first eight months of 2016, 51,300 Jeep Renegade were sold in Europe, with a 47,1% increase versus the same period in 2015. A success story, further confirming the Jeep small SUV’s leading role as top-selling model of the brand in the European market. Top countries for Renegade sales in the region are Italy (22,800 units), the UK (7,200 units) and France (6,000 units). 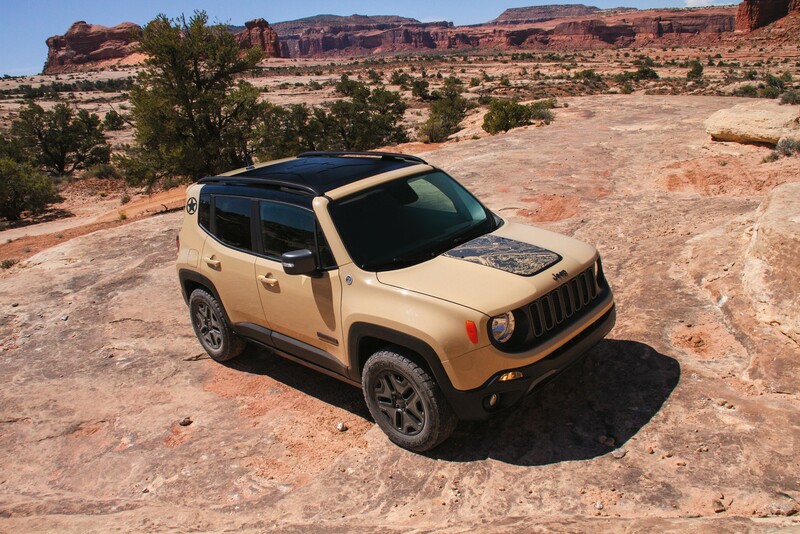 Based on the Trailhawk trim, the new Jeep Renegade Desert Hawk limited-edition model was inspired by one of the most extreme locations where the legendary off-road capability of Jeep vehicles as well as the freedom of going beyond the known limits to venture into unexplored territories that is in the brand’s DNA are expressed at their best. As a matter of fact, in the Jeep language, the name ‘Hawk’ suggests a unique and more rugged appearance, with functional features that deliver an increased level of 4×4 performance. First of all the unique hood decal, featuring the outline of a map and the US Army Star decal located on the vehicle’s side close to its rear end are both styling cues introduced specifically for this limited-edition model. A Matte Black front grille and 17″ Black Aluminium wheels also contribute to enhance the distinctive look of this vehicle. Further exterior appointments characterizing the Desert Hawk are the off-road skid plates, the rear tow hook and the ‘Deserthawk’ logo on the driver’s door. The tribute to the desert is also suggested by the exclusive Mojave Sand exterior that reminds of the distinctive color of the sand, sported by the vehicle on display in Paris. The interior of the new special edition model features Black leather and cloth seats enhanced by White accent stitching and “Deserthawk” logo embroidered on the upper portion of the backrests. Standard equipment includes front and rear parking sensor, dual-zone automatic climate control, premium instrument cluster with 7″ TFT color display, tire pressure monitoring system and cruise control. In addition, the Renegade Desert Hawk features UConnect system touchscreen radio with 6.5″ color display, standard navigation and the new embedded Jeep Skills application that provides real time information on the driving performance and perfectly fits with the mission of this new limited-edition model: to allow the driver to understand the legendary Jeep off-road capability while being up with the times. Optional features available on the Desert Hawk are the My Sky roof with removable panels for an authentic open-air driving experience, the Parkview rear camera and the 9 speaker Premium audio system by BeatsTM. With its distinctive, aggressive look, standard special off-road equipment including the Jeep Active Drive Low system with 20:1 crawl ratio, Selec-Terrain system with exclusive Rock mode and Hill descent control, the Desert Hawk stands out as the most capable Renegade model and the most capable small SUV in its category for off-road driving. It will be introduced in the Jeep dealerships across Europe starting November, with the 2.0-litre Multijet II diesel featuring 170 HP and the 9-speed automatic gearbox. Available exterior colors in addition to Mojave Sand are Anvil, Solid Black and Alpine White. In Paris, the Renegade powertrain offer will be further extended thanks to the introduction of the Dual Dry-Clutch six-speed automatic transmission (DDCT) on the efficient 1.6-litre Multjet II engine with Stop&Start. The new engine-transmission combination will be available only on Renegade models featuring the front-wheel-drive configuration starting end of November across Europe. The new gearbox will be made available on the most popular and sold Renegade engine in the region – the 1.6-litre Multijet II diesel engine delivering 120 horsepower – and thanks to its efficient fuel economy ratings and low CO2 emissions, respectively 4.5 l/100 km and 118 g/km (combined cycle), it will satisfy customers’ more diverse needs being the perfect choice for both private and company cars drivers. Formerly mated only with the 1.4-liter MultiAir2 Turbo engine of the Renegade, DDCT uses two clutches to connect the engine and transmission rather than one. Using two clutches makes it possible to carry out “power shifts” without any break in power transmitted to the ground because the ratios of the second half-gearbox are synchronized while the first is in operation. This means that the transmission of torque to the wheels is not interrupted – even during gearshifts, resulting in improved vehicle performance and driving comfort. Designed to enhance the already bold design of Jeep Cherokee, the ‘Night Eagle II’ special-edition model will be based on the Limited trim level, and will feature a special aesthetic treatment with black styling cues to enhance the aggressive look and sporty character of the Jeep mid-size SUV. Building on the commercial success of the Night Eagle special edition presented exactly one year ago at Frankfurt Motor Show, the new Night Eagle II limited-edition model reasserts Cherokee’s audacious personality and unique flair for customization through a distinctive style conveyed by several dark design elements and glossy black accents on the exterior. These include the front ‘Jeep’ badge, Black DLO, grille surrounds and front fascia applique, Black Gloss roof bars, 18″ painted wheel with Gloss Black finish and Black ‘Jeep’ and ‘4×4’ badges. The exterior is completed by a dedicated Night Eagle badge. In the cabin, the comprehensive standard equipment available includes Black interiors, premium Nappa Leather-trimmed heated and ventilated bucket seats, eight-way power driver seat with four-way power driver lumbar adjust, 7-inch full-color, TFT reconfigurable instrument cluster, Uconnect radio with navigation and 8.4-inch touchscreen, 506-watt Alpine audio with nine speakers and subwoofer and two-zone climate control system. Sporting a Black exterior and black leather interior, the Cherokee Night Eagle II displayed on the Jeep stand in Paris offers a complete standard equipment, including bi-xenon headlamps, Parkview rear backup camera, Park Sense front and rear park assist, automatic headlights and rain sensor, power liftgate and folding mirrors. An array of advanced safety features is also included in this special-edition model, such as Lanesense Lane Departure Warning, full-speed Forward Collision Warning with Crash Mitigation, Adaptive Cruise Control with Stop&Go, Blind Spot Monitoring and Rear Cross Path Detection and ParkSense Parallel/Perpendicular Park Assist. The CommandView® dual-pane sunroof completes the list of features. The Night Eagle II is powered by a 2.2-litre Multijet II 200 HP engine offered in combination with the 9-speed automatic transmission and Active Drive I 4×4 system. It will be available in five exterior colors, including Black, White, Billet Silver, Granite Crystal and Deep Cherry Red starting December across Europe. 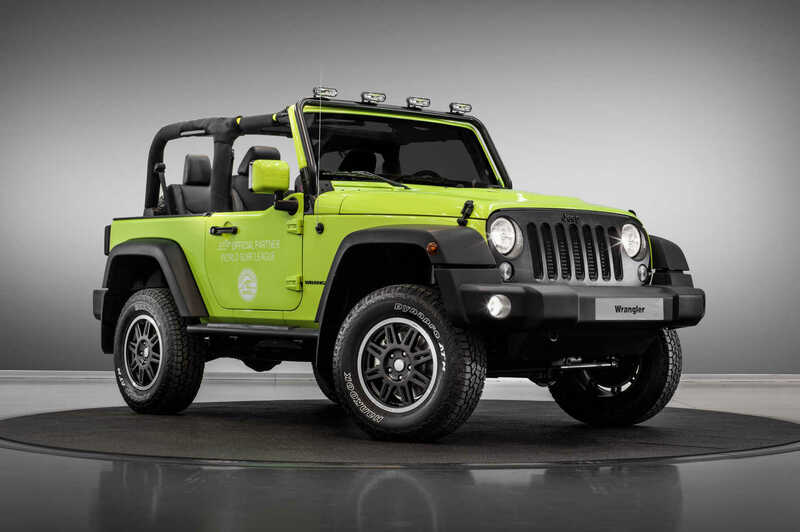 The Moparized Jeep Wrangler showcased in Paris is based on the Rubicon trim level – the most extreme and capable off-road vehicle in the Wrangler range and boasts Hyper Green exterior and Black leather interior. In order to increase the off-road capability of the Rubicon model, this vehicle has been upgraded with MoparONE, the special, purchasable customization package by Mopar including 2″ lift kit, steering stabilizer, skid plates and 17″ black painted cast aluminum wheels with large Hankook Dynapro 265/75 R17 tires. This special package by Mopar transforms the Wrangler Rubicon in the first ‘Moparized’ vehicle for off-road driving featuring homologated accessories and lift kit. The MoparONE pack will be soon on sale at the official Jeep dealerships of the EMEA region on both the 2-door and 4-door Rubicon models. Black windshield mounted light bar with off-road halogen lights, vented hood, tubular side steps and body-colour half doors complete the look of this ‘Moparized’ Rubicon model, further enhancing the unique personality of the iconic Wrangler. Jeep Wrangler Rubicon with MoparONE pack is powered by the 2.8-litre 200 HP Euro 6 turbo diesel engine with 5-speed automatic transmission. Based on the Longitude trim level the ‘Moparized’ Jeep Renegade showcased in Paris boasts a distinctive Solar Yellow exterior with Black hood and US army star door decals, matt black mirror covers and front grille. In order to enhance the off-road look of the Jeep small SUV, this vehicle has been fitted with a special customization package by Mopar including 1″ suspension lift kit and large All-season tires. 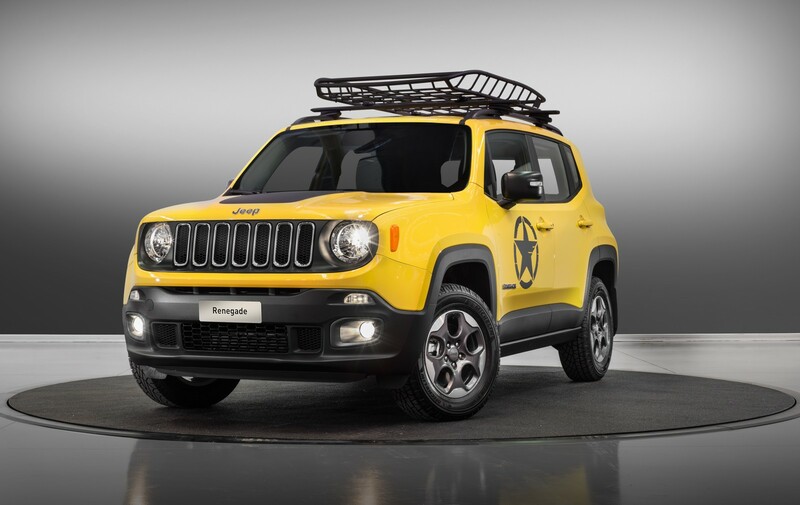 The Jeep Renegade Solar Yellow on display in Paris is powered by the 2.0-litre 140 HP Multijet II diesel engine paired to the six-speed manual transmission and Jeep Active Drive 4×4 system. 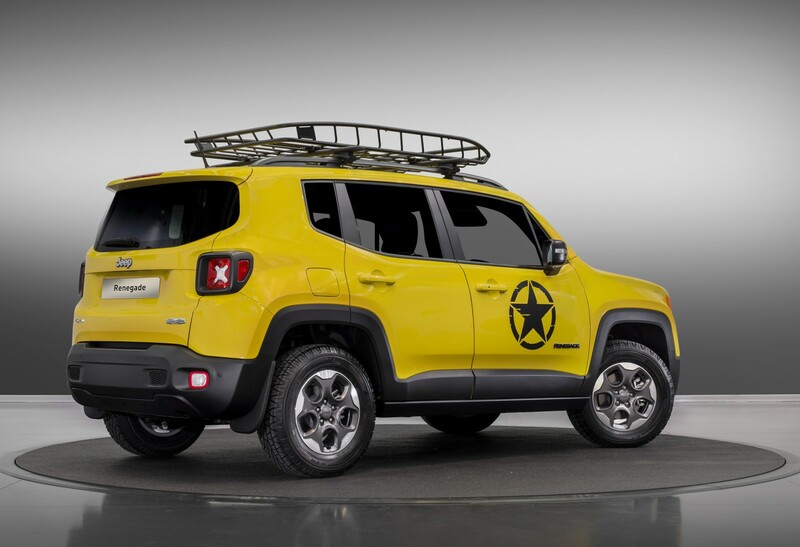 In brief, the MoparONE package is available in two different versions – one for Wrangler and one for Renegade – and offers specific content according to the model, enhancing the off-road capability of both vehicles. The Jeep exhibition area is characterized by clean shapes that outline an essential, contemporary structure featuring the multiple terrains where Jeep vehicles can express their character at their best: in the city as well as on extreme off-road trails. The use of finely crafted, natural materials, such as wood and stone, suggests a setting that is a combination between a wild outdoor landscape and a sophisticated urban environment, thus hinting at the two ‘souls’ in the DNA of the brand: the core, rugged soul that belongs to Wrangler and the more premium and refined one, expressed by the flagship Grand Cherokee. The technological and innovative soul of the Jeep brand is emphasized with large LED wall surfaces featuring videos of the Jeep brand and its models. A corner dedicated to Uconnect LIVE, will host an interactive totem where visitors can test its connected services and live the Jeep Skills experience thanks to the Oculus technology and 360-degrees videos. In the middle of the stand a dedicated area will host the ‘Moparized’ Wrangler Rubicon with MoparONE pack and an array of ‘virtual’ activities dedicated to surfing. The ‘surfing corner’, characterized by a floor featuring a special ‘sand’ effect and contrasting with the stone floor under the wooden bridge, will offer visitors the chance to enjoy the “Jeep Ride” game designed to support the surfing competitions of the prestigious World Surf League (WSL) men’s and women’s 2016 Championship Tour (CT) taking place in Portugal and France and starring the Jeep brand as the WSL’s exclusive automotive Global Partner for the second year running. A selection of exclusive accessories and genuine Jeep spare parts made in collaboration with Mopar will be showcased in a dedicated corner of the exhibition area.